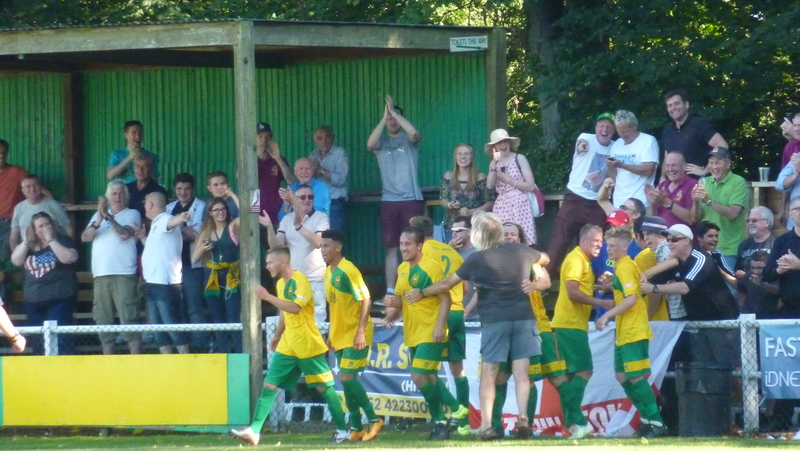 AS HITCHIN TOWN celebrated their fourth and final goal in an incredible afternoon at Top Field, a straggly-haired fellow crept across the pitch to join in the celebrations. The greying, ageing (but still very athletic) hippy of a football man raised his arms in celebration and then dragged his legs over the perimeter fence. He had clearly been though this routine before. Indeed he had. May 1993, Hitchin Town v Uxbridge, the Isthmian League Division One decider. The long-hair belonged to one Robin Wainwright, coach of Hitchin 23 years ago and now helping the skipper of the 1993 side, Mark Burke, behind-the-scenes. This is Robin’s time, for 50 years ago, he was one of the ball-boys at Wembley when England beat West Germany 4-2 in the World Cup final. That’s not his only reference point, for he also had a distinguished non-league career at Wealdstone, where he won the first Conference-Trophy double in 1985. Not only that, Robin is mentioned in Eamon Dunphy’s famous “Only a game?” book from his time with Millwall. He may look like a member of the Eagles (a favourite band of his) or Lynyrd Skynyrd, but Robin Wainwright is very much a football man. You could forgive him for being a shade excited at the end of an engaging 90 minutes. Hitchin came back from three-down to win 4-3 against Cinderford, a club that didn’t fancy making the step up from the Southern League South & West to the Premier. It didn’t show, for in the first half, Cinderford played well and went two goals up against their hosts. For 45 minutes, the tipsters that predicted another Hitchin play-off bid looked to be a little over-optimistic. Despite losing (or about to lose) three of their key players: keeper Charlie Horlock; utility man Kane Smith; and midfielder Jonny McNamara, Hitchin had a good pre-season. For once, the talk at Top Field wasn’t about the landlords or the lease, the activity at the old ground during the summer was centred on new floodlights, shining towers of illumination that replaced the rusting derricks of yesteryear. 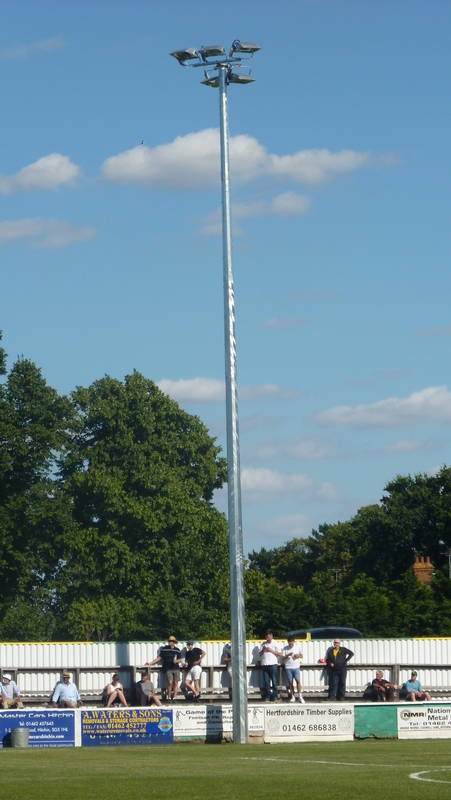 Hitchin’s new floodlights are a £60,000 statement of intent, suggesting that perhaps the future is in Fishponds Roads, after all. Cinderford were not playing to the script, though. 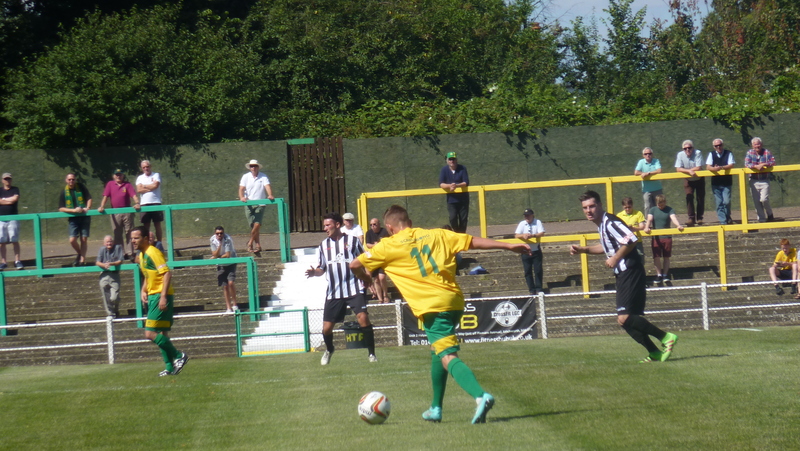 The first goal came after 19 minutes when Sam Hunt’s corner was touched in by Lewis Fletcher. The Hitchin defence, which features new goalkeeper Zac Barrett (who actually first joined the club when Darren Salton was manager) who was part of the Cambridge City exodus. For the first half, the back line looked hesitant and disconnected, certainly at set-pieces. The second Cinderford goal, a minute from half-time, saw Hunt’s free kick somehow deflect into the net through a crowded area. It got worse in the second half as Carlos Moreira scored with a tame shot on goal on 59 minutes after Lewis Rolfe lost possession. Where to now, Mark Burke? Hitchin spent much of the game pretending they were playing a crossbar challenge or other training games that involved trying to hit the woodwork. They struck the bar or post five times, including twice in a matter of seconds from the alice-banded Matt Lench as Hitchin mounted a comeback. They had finally scored on 72 minutes when Mason Spence, one of Hitchin’s better performers, lobbed a cross into the area and it seemed to deceive Ben Fletcher as it found the net. Still a lot of work to do. With eight minutes to go, Callum Donnelly shot low past Fletcher to reduce the arrears further. Now there was a glimmer of hope. In the 88th, Lucas Kirkpatrick made it 3-3 and it was easy to see that Cinderford were now on their knees. Two minutes on, a penalty was awarded and Will Wright blasted home to make it 4-3. Enter Robin Wainwright, who relived the moment he ran onto the pitch against Uxbridge to rejoice at Gary Williams’ winning goal. This time, there was no jumping into the arms of the goalscorer – Wainwright is now 65 years of age! It was an astonishing last 15 minutes, but you couldn’t deny that Hitchin had dominated the game, despite falling three goals behind. Nobody could remember it happening before, but there was a game with Tooting & Mitcham back in the 1970s when the Canaries performed such a feat. As for the Hitchin team, most people have pointed to a lack of striking power over the last few seasons, despite the success of Burke’s young team. “I’m not worried about scoring goals – we got four today – but at the back we need to sort a few things out,” he said after the game. On the evidence of this stirring fightback and the mood in the camp, Burke’s team will light-up Top Field in 2016-17 as much as the new floodlights. I stood watching the entire game with a long standing Cinderford supporter. Whilst chatting during the match he gave me quite an insight into the current situation at their club. Following the fiasco surrounding their promotion together with the Evesham factor at the end of last season this led to a complete management restructure within the club. When they turned out last Saturday afternoon at Top Field their number 4 Captain Josh Nelmes plus one other were the only two players who had remained from the promotion winning side from the end of last season. All the other players had apparently returned from professional clubs from which they had previously gained scholarships for to help the club out in it’s time of need. Their number 9, Gethyn Hill had even played for the under 19s for the Welsh national side. So given that they were a team literally cobbled together, barely knowing each other as well as having virtually no real pre-season warm ups you have to give them so much credit for taking the game by the scruff of the neck from the first kick of the ball. The Cinderford guy reacted like he had won the lottery as Cinderford went one, two and then three goals up. Yet right from the start he kept insisting that they would not be able to maintain the fitness levels for the entire 90 minutes and so he was right. Full credit to Hitchin for turning an entire game on it’s head and coming back from what seemed like the impossible. So, you may be forgiven for thinking after the whistle had blown well that maybe Cinderford had given it their best shot, run out of steam and now it would be all downhill for them. Well, not so, by the looks of things. Because just three days later they thrashed Dorchester Town 4-0 at home on their following league encounter. This Cinderford team could continue to surprise people and who knows they may well be the dark horse of the division for the 2016-17 season. Great report on the game Neil.